Upright Four Play — When I first moved to Portland from DC I missed the latter city’s recent love affair with Belgian beers. Luckily Upright started brewing soon after I got here, producing superb farmhouse-style ales just a few blocks from my apartment. Their first anniversary beer is a sour cherry wheat ale aged in Pinot Noir barrels. It’s one of the best fruit beers I’ve ever tasted, dry and with no hint of the artificial notes you find in some cherry beers and spirits. There are only 80 cases of 750 ml bottles available so this will go fast at the April 9 release party. If you only want to buy it for the label, that’s OK too. Woodford Reserve Master’s Collection Sonoma-Cutrer Finish — A customer brought this in for me right before Carlyle closed. Finished in Chardonnay barrels, it’s possibly the most unique bourbon I’ve tried. It has a distinct, funky note, and I mean that in a good way. The finish is very smooth. Not for everyone, but definitely worth trying if you can find it. It’s going to be painful when I pour the last of this bottle. Ledaig 10 Year — Lance Mayhew turned me on to this Scotch recently. It’s an island whisky from Mull, distilled by Tobermory. It’s fairly light in body and has a very well-balanced dose of peatiness. I like this Scotch a lot and could see it becoming a staple in my home bar, a great option for when you’re not in the mood for a big, assertive Islay. One of my favorite whiskies of the moment. Deschutes Hop Henge Experimental IPA — At 95 IBUs and with the word “hop” right there in the title I was expecting this to be the sort of bitter hop monster I don’t really go for. However Jeff at Beervana gave it an intriguingly good review so I decided to give it a try. The verdict? This is a seriously good beer. Yes, it’s hoppy, but it somehow manages to extract all the citrusy goodness from the hops without getting too bitter. Hangar One Vodkas — What, me say nice things about vodka? It doesn’t happen often but these are impressive. Hangar One sent samples of three of their flavors: Kaffir Lime, Buddha’s Hand, and Mandarin Blossom. They all avoid the one-note simplicity of many flavored vodkas. I’m not currently creating any cocktail menus, but if I were I’d consider working one of these onto them. Also in local press, today’s Portland Mercury is all about my favorite spirit, whiskey. Included in their whiskey feature is a round-up of local whiskey cocktails, including this blog’s Curse of Scotland and drinks from some of the best bartenders in town. Check it out here. I feel a “Money” drink is something you can put in front of anyone, regardless of tastes or distastes about the spirits involved. 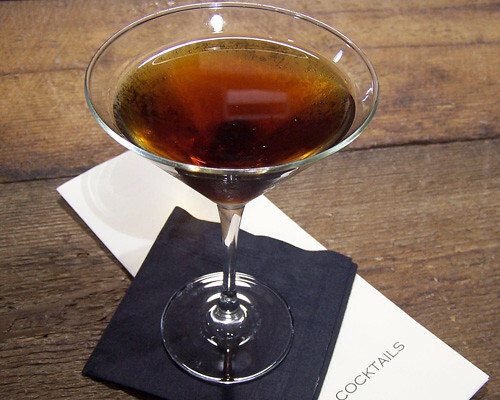 Come up with a drink or a list based on spirits about drinks that would appeal to anyone. example: turning someone onto a Corpse Reviver #2 when they like lemon drops. Creatively speaking, this is not the most inventive cocktail in the world. Call it a variation on a Manhattan or Boulevardier. But the cinnamon notes of Ramazzotti make it a perfect amaro for winter cocktails and the ignited oils from the orange zest give the drink appealing aromatics. Almost as importantly, the light show that results from spraying citrus oils through a flame is a great conversation starter that inspires other customers to order the drink. When you want to bring in the money, fire is your friend. *Yes, I sneaked a Martian Manhunter reference onto my cocktail menu. And yes, this makes me happier than it rightfully should. My friend Lance Mayhew has an enviable new gig: He’s now the whiskey writer for About.com and his debut column covers whiskeys and whiskey cocktails to enjoy with Thanksgiving. Read it here and check back for upcoming articles. I’ll be taking the day off to join Lance in having some of these whiskeys, lots of good food, a few rare beers, and possibly a cigar. I hope you all have a wonderful holiday. Quick story: A few years ago I made the transition from barista to bartender. The place where I worked was great for learning the basics, but it wasn’t at the level of craft cocktail bars and mixology had yet to really take off in DC. Unenamored with bartending, I went back to working in a think tank. To celebrate my new job I booked a trip to San Francisco, where I visited Bourbon and Branch and a few other places that opened my eyes to how good craft bartending can be: precise measures, freshly squeezed juices, seasonal ingredients, etc. That experience is what set me on my current path of cocktail blogging and abandoning the East Coast for the Pacific Northwest. All of which is a roundabout way of saying that though I didn’t make it to the finals in this weekend’s cocktail competition at the Great American Distiller’s Festival, I can’t complain about who I lost out to: Ali Tahsini from Bourbon and Branch. The guy’s a fun, talented bartender and went on to take second, a solid feat given that he had to come up with an on-the-spot cocktail using ouzo. Fellow Portlander and DC escapee Evan Zimmerman won first. Shake over ice and strain into an ice-filled rocks glass; garnish with slice of crab apple on skewer. This is another drink that benefited immensely from collaboration with the chef at Carlyle. It was his idea to smoke the apples and they really made the drink. The apples were poached Jonagolds which were then smoked over applewood chips. We puréed these along with a little smoked butter for extra depth and smoothness. It came out deliciously and if I wasn’t saving it for drinks I would have eaten it as is. The gastrique was made with apple juice, apple cider vinegar, cinnamon, and sugar. The spiced, pickled crab apple is from Robert Lambert and made the perfect garnish, along with saving me the trouble of poaching my own apples that probably wouldn’t have been nearly as good anyway. 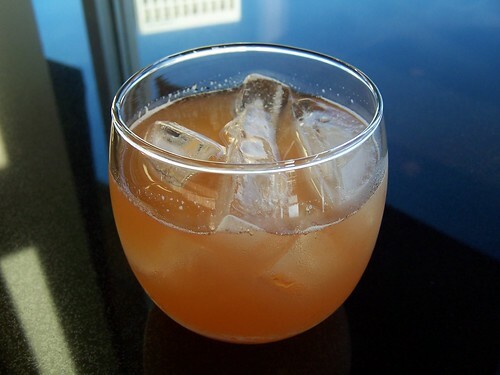 The cocktail is essentially an update to the Stone Fence, the drink Ethan Allen and the Green Mountain boys supposedly consumed before storming Fort Ticonderoga. I admire anyone who drinks hard and attacks the government, so I named it after him.